I have been chosen Artist of the Month by the online magazine, ADN CREATIVE. It is an amazing app which, this month, will bring you some of my work and a quick Leonardo tutorial with some helpful tips I always use in my work. 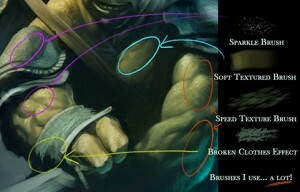 The full illustration from TMNT contains a few steps of the process (composition, merge color, use of brushes…). Other dude stuff, samples, complete Bio and more in Apple Store, Android; search tag . If you want to see any issue, including where I am… let´s play ADN CREATIVE! In fact, It´s an honour to be in the BEST and most PRECIOUS APP I´ve ever seen!